7 Why ecobee vs. other connected thermostats? 8.1 Item 1) Follow the readme file's step by step instructions under - setup time = around 5 min. MyEcobee device and related smartapps have required thousands of hours of develpment & testing efforts to build (around 7000 lines of code just for the device), so a minimum financial contribution is now required to get the latest code. All of my smartapps are at the end of the "new (only at github)" window. You can also copy and paste (manually) them from my github. In any case, you'd need to save & publish at the end. Functionality: Supports regular ST thermostat capabilities and all other ecobee features & commands that enable you to control other devices connected to ecobee such as humidifiers, dehumidifiers, HRV/ERV (amongst others). 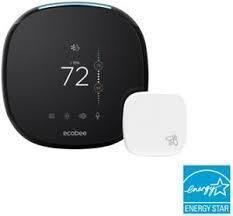 Support of all models of ecobee thermostats (ecobee4, ecobee lite, ecobee3, EMS, Smart-02, Smart-SI). Support of many ecobee commands through their standard APIs. attribute "programScheduleName"    // values "hold" for manual holds, "auto" for automatic holds or "climate name"
attribute "programType"           // values "vacation", 'program", "hold"
a graph showing the current runtime stats (Daily, Average Weekly, Average Monthly) according to the current thermostat mode (cool, heat). It also displays the heating/cooling setpoints, the indoor & outdoor temperature for trend analysis. Why ecobee vs. other connected thermostats? There have been a lot of threads in the ST community forum about this topic. The answer is really dependent on your use cases/requirements. You can not only control your heating/cooling setpoints, but also control your humidifier/dehumidifier/HRV/ERV. 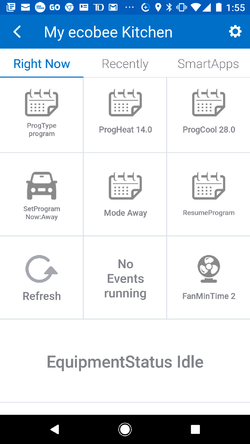 You can also define climates (programs) to control your heating/cooling setpoints AND your fan settings (auto/manual or circulate for x min/hour) throughout the day. Based on ecobee's schedule, you can easily change your thermostat & fan settings every 30 minutes if needed. You can then rely on ecobee's schedules and only use ST to let ecobee know when your family is present or away from home, so that there is no overlap between the 2 systems. 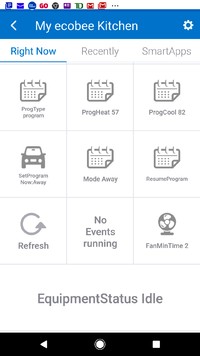 Most of the ST thermostats (even the Nest) connected to the home automation platform lose their scheduling capabilities. With MyEcobee device you can make SmartThings and ecobee work together for more comfort and energy savings at your home! If you have multiple zones in your home, you can install several thermostats and group them for easier settings management for vacations, or just general scheduling . With the ecobee4/ecobee3/lite, you can buy remote sensors that you place in some strategic rooms in your house to average out your temperature, and get better comfort in colder or hotter places in your home. Here are the main pros/cons. Capable of handling multiple zones & grouping features (for vacations,schedules, and other settings). Ecobee has a portal where one can see her/his heating/cooling stats and compare her/his energy consumption vs. other users. It's called HomeIQ. Ecobee does not have very strict confidentiality rules such as Google/Nest. You are allowed to download your data and manipulate it which simplifies any integration with a home automation hub such as ST.
Rich APIs that allow you to virtually control all aspects of your ecobee thermostat: you can create a temporary 'hold', resume the scheduled program, control any device connected to ecobee (hrv/erv, humidifier, etc. ), create a program/vacation, modify the program/vacation, etc. Nest APIs don't allow most of these features as they are very limited. Contrary to ecobee, z-wave,zigbee thermostats and other wi-fi thermostats (like the Nest) are totally dumb when connected to a home automation hub. These thermostats then lose their scheduling capabilities... So, you need to re-program your schedules using different HA scripts which can be a pain if you have very precise scheduling requirements (in a large home for example). It may be because some z-wave thermostats use batteries, but it is not as responsive to commands as an ecobee thermostat. If you want to change any settings remotely, it can take a while before the thermostat registers the command and executes it. Sometimes, it does not react at all which is kind of frustrating (due to mesh issues or other connection issues). Item 1) Follow the readme file's step by step instructions under - setup time = around 5 min. However, please note that the 3.6 firmware is required for occupancy updates. Also, ecobee motion sensors don't allow real-time events. Here are some basic explanations on how to maximize your ecobee thermostats' use under ST. Most of my Ecobee smartapps have been developed with this principle in mind: ecobee is responsible for the basic scheduling (as it's more reliable and also accessible from the physical thermostat anytime) and ST is responsible for managing exceptions to the schedules that you define (i.e., 'Away' or 'Home' mode switch as an example). So, here are the suggested steps for setting up ecobee and ST, so that they work together for your comfort. Go to www.ecobee.com, register, and set your climates based on your regular schedules (ex. 7h-8h am 'Awake', 8ham-5hpm 'Away' for work, 5h00-10h30 pm 'Home',10h30hpm-7h am 'Sleep' on weekdays, define also your schedules for the weekends). With ecobee, you can not only set up your heating/cooling setpoints, but also your fan settings in your climates (fan set to 'On', 'Auto', and 'Circulate' with the fanMinOnTime settings which allows you to set a minimum fan time in minutes per hour). As your preferences may be very different from mine, I won't recommend here any specific cooling/heating settings. It really depends if you put more emphasis on your comfort or your savings...It's a delicate balance between the 2 dimensions that your may need to fine tune for you and your other family members (if any). To avoid overlaps between ST and ecobee, one needs to use the holdType input parameter to define the default type of 'hold' (exception to the basic scheduling). One may want to use the 'nextTransition' holdType, so that a 'hold' stays only active till the next transition on the ecobee schedule. By default, the holdType is indefinite (permanent hold). The holdType input parameter will apply to ALL your setpoint overrides to the usual program at ecobee. Climate changes take precedence over temporary holds. You may need to resume the thermostat prior to set up a new temporary hold with a specific setpoint or fan setting. Please note that you can specify the holdType parameter as a map in any calls to the setClimate() and setHoldExtraParams() commands in the DTH. Examples of smartapp calls: P.S. The first parameter is the serial number of the thermostat (if null, then the current thermostat is used). The setpoints must be number. // call setThisTstatClimate() which will only keep one active hold at a given time. For Core/WebCore, you may want to use the setHoldWithHoldType method() which doesn't use Maps as the rule engines don't support them. If you don't have the method predefined in the DTH header, you'd need to downoad the latest version at my sellfy store. The first parameter is the serial number of the thermostat (if null, then the current thermostat is used). The setpoints must be number. You can also called setClimateWithHoldType for your climate (program) change. The first parameter is the serial number of the thermostat (if null, then the current thermostat is used). P.S. device above is the name of your device. You may substitute it for the current name of your device in your WebCore script or smartapp. Here is a list of smartapps that you can use in progressive order of complexity. The most complex smartapps are only needed if your requirements are high. This smartapp sets the ecobee thermostat to 'Away'/'Home' mode according to the corresponding ST hello mode changes. So, you can configure two instances of the same smartapp: one for the 'home' ST Hello mode that will set your ecobee thermostat to 'Home' when you're back from work for example, and another one for 'Away' for the 'Away' ST hello mode when you leave your home. You'd need to rename the smartapp at the last screen as 'ecobeeChangeAway' & 'ecobeeChangeHome' for examples. If you want more accuracy/granularity when setting your thermostat to 'Away' , you may want to use the 'AwayFromHome' smartapp. This smartapp allows you to more precisely define the presence and motion sensors required to set your ecobee thermostat to 'Away'. This smartapp was initially created because the ST hello mode changes were not always reliable (now it's much better). The smartapp can also trigger specialized actions when leaving your home than what ST can offer: turning off the lights, locking my doors, arming my alarm system (it needs to be connected to ST), arming my cameras, etc. On the opposite side, ecobeeResumeProg resumes the ecobee's climate (or program) when one of the predefined presence sensors is back home, or when there is a ST Hello Mode change, or when one of the motion sensors specified in the smartapp detects movement in your home. 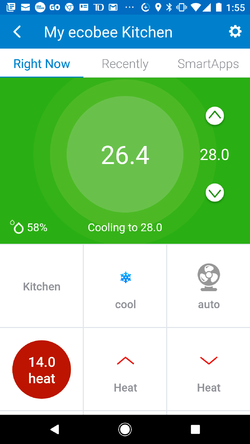 The smartapp allows you to set up some 'more or less heat' and 'more or less cool' thresholds for increasing/decreasing the heating/cooling setpoints based on an outdoor temp sensor (could also be a virtual weather station).and a user-provided adjustment setting (ex. +/- 5°F) during the day. The average temp calculation algorithm has been added (similar to ecobee3's follow me feature), but you can now use any of your ST-connected indoor temp and motion sensors. This way, you can enable more heating/cooling when your house temperature varies from one room to another. In fact, with this smartapp, you can also use any types of ecobee thermostats (not only ecobee3 or the ecobee lite) such as the ecobee Smart-Si, EMS, or stat-02 (which are the older models) to have basically the same behavior as the ecobee3 and its remote sensors. 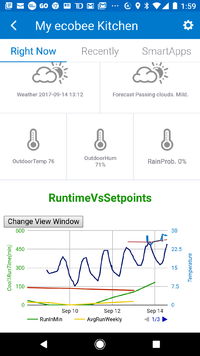 In brief, this smartapp combines all the previous smartapps in one single package because it monitors your home based on outdoor/indoor sensors and can set your ecobee thermostat to 'Away' or 'Home' according to a time threshold (in minutes) that you define. Again, this smartapp makes automatic adjustments to your existing ecobee schedules, so you also need to define your basic scheduling within ecobee first. 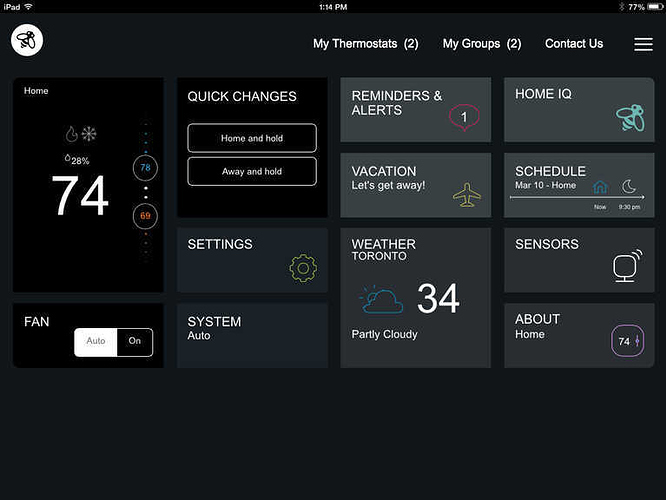 The ScheduleTstatZones smartapp can control any smart thermostats (not only ecobee but also Nest and any z-wave thermostats) and ST-connected vents (such as Keen Home vents or ecovents) to reach the ultimate comfort in the preconfigured 'zones' of your home. 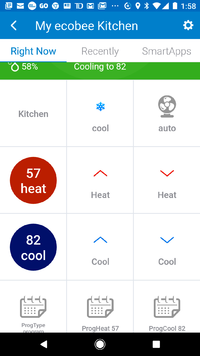 The smartapp's logic is also based on indoor temp/motion sensors, an outdoor temp sensor, and smart vents (optional). You'll then be able to configure your own schedules (ex. weekends, evenings, mornings, weekdays). The smartapp will then set/adjust your main thermostat & your smart vents (and some optional room thermostats for baseboards or fireplaces) every 5 minutes based on the average temp algorithm calculated from the rooms' temp sensors that are part of the zone that you've configured. As this smartapp works with any smart thermostat, it will not depend on any basic scheduling done at the ecobee or at the Nest portal, but will rely on the ST scheduler only. The ecobeeSetZoneWithSchedule smartapp has the same features as ScheduleTstatZones, but it has been designed specifically for the ecobee thermostats. 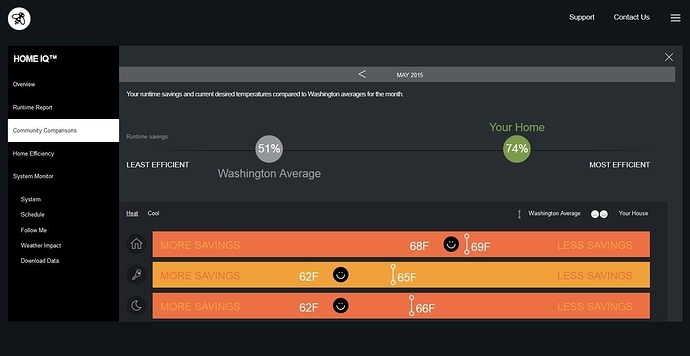 It uses the climates/programs defined at the ecobee portal (i.e. ecobee scheduling) as a baseline for any thermostat adjustments. If you want to take full advantage of the new "tips" feature starting with My Ecobee device v5.0, you'd need to set up some additional smartapps in your ST account. The smartapps generate the daily, weekly, and monthly stats required to detect any trends in your energy consumption. The three smartapps will resubmit themselves automatically after the 1st run. The dates provided at the first run are irrelevant (you can use the default dates). 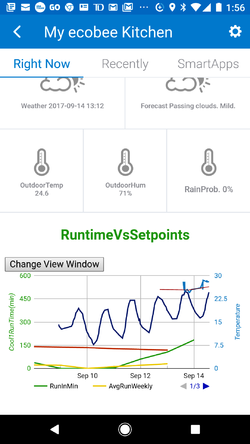 The smartapp will look at your current indoor/outdoor conditions and will generate the energy and comfort tips for you. The smartapp generates up to 5 tips at a time, and the tips are saved in the device to avoid repeating the same tips over and over. Each subsequent smartapp's run will generate new tips till there is no tips available. The latest version of My Ecobee device uses the HTMLtile for rendering the graph. As ST is not supporting the HTMLTile, it may not work properly on all devices. This is a ST UI platform issue and not related to my code per se. b) Click on My Ecobee device, click on "simulator" on the right and the button under "API URL" as indicated below to launch the rendering. Please contact ST support if you have any HTMLTile issue on your devices. After some testing, and contact with ecobee support, I've realized that the ventilator commands (On, Off, Auto) are not supported now. Ecobee said that they are planning to support them in the future. However, the ecobee3 thermostat should support the "ventilatorMinOnTime" command. Update: Following some ST DB and some scheduler changes (more to come), the http exceptions previously generated by ST are gone. I just keep the documentation just in case (as a reference). used for the PIN authentication method (not with the Service Manager called the MyEcobeeInit smartapp). If you do it, you may experience authentication issues. It may be caused by some connection pool management issues or just DB/server issues that are not tracked by either party (ST or ecobee). If you have many connection issues, please contact ST support as My Ecobee's device code does not have any control over the connection issues between ST and ecobee. My smartapps can notify (handleException flag needs to be set) you if the number of exceptions is too high and may ask you to re-connect (re-login) at ecobee. If you have many ecobee thermostats and/or many ecobee3's remote sensors, create many MyEcobeeInit (for 2 or 3 thermostats max) instances and/or many ecobee3RemoteSensorInit (for 2-3 remote sensors max) instances and split your ecobee devices between the instances that you created. You can assign a different name for each instance on the last page. See the troubleshooting section, item no 6 for more details about the ST-ecobee connectivity issues. Here are some typical troubleshooting cases explained below. For your specific use cases, you may want to contact the author (there may be some support fees applied). Please refer to the installation readme (prerequisites) to find out what is the right shard for the procedure. you'd need to enable oAuth as specified in step 2f) in the readme. If you get the "physicalgraph.app.exception.UnknownDeviceTypeException" error in the IDE, then please make sure to create the required device type first (step 1 in the readme). Don't forget to create the DTH (Device Type Handler) and the smartapp under the right shard (refer to the prerequisites in the readme file at the github). You must first configure your new thermostat at ecobee and make sure it is connected and communicates via wi-fi. Also, make sure that your ecobee thermostat is connected to wi-fi. My ecobeeInit is a smartapp that polls the My ecobee device(s) on a regular basis to ensure that the refresh (authorization) token is constantly renewed when needed. Ecobee requires (contrary to some other cloud providers) to refresh its authorization token every 59 minutes for greater security. The device handler code is an interface between ST and ecobee, so there are some dependencies on both platforms. The algorithm within MyEcobeeInit and MyEcobee device has been coded to renew automatically the authorization token every 55 minutes or so. If it fails to renew the token, then the connection with ecobee will be lost. So, the algorithm will work all the same after 1 hour or several days. So, if the smartapp works for more than 1 hour, it should work for days even months without issues provided that there are no other external factors (ex. connection issues between ST and ecobee with your physical thermostat). For the past months, it has happened more frequently. Here is the ecobee status page where you can register for some outage warnings. (b) It could be due to a (temporary) bad internet connection on your side. Ecobee thermostats connect thru wifi, so if the physical thermostat is not connected for a while, then you may not have control over the thermostat during that timeframe. (c) It could also be an issue on the ST side. We've all experienced issues with ST scheduling. 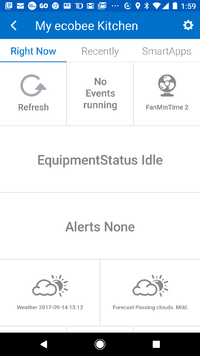 If the smartapp is not rescheduled every 20 minutes, and you don't manually poll the thermostat through the ST app, then the "refresh token" will not be obtained, and the authorization token may be lost. You may need to execute getEcobeePIN again, and enter the PIN at the ecobee portal (for the standalone version) Under the ST app, press the 'refresh' tile on your device to check if it's running normally after. Execute MyEcobeeInit and re-authenticate (re-login) at ecobee by pressing on 'ecobee connect' on the 2nd page. Under the ST app, press the 'refresh' tile on your device to check if it's running normally after. DO NOT EDIT THE FOLLOWING DEVICE PREFERENCES: appKey, ecobeeType or thermostatId as those are supplied by MyEcobeeInit automatically. 4) Verify that the takeAction job is scheduled in the future (check the timestamp associated to the Next Run Time) under "Scheduled Jobs"
ST is aware of this problem for months, but has not made any permanent fix yet. d) If you have multiple thermostats exposed to ST, try creating multiple instances of MyEcobeeInit (1 for each thermostat) as ST has some rate limiting issues that sometimes impedes the auth token renewal. You can assign a different name for the smartapp instances at the last page. Some workarounds have been implemented in my code to get around the ST scheduling issues. (d)- You'd can also used a (virtual or physical) switch in the smartapp and use a Rule Engine (WebCoRE/CoRE, SmartRules) to trigger the virtual/physical switch based on a timer. 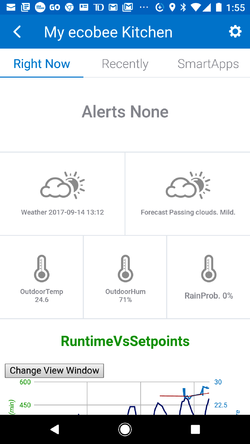 You can use either a temp Sensor (such as Aeon MultiSensor, SmartSense or Keen Vents), a motion sensor (such as the SmartSense), a power meter (such as Aeon HEM) or a powerSwitch to reschedule the smartapp if needed (as long as this device is polled on a regular basis -ex. every 5 minutes ) so that it can create a 'heartbeat' for the smartapp. Do not use an ecobee remote sensors or the ecobee thermostat as this is not an external "heartbeat" for ensuring proper scheduling. Finally, please use 1 or 2 watchdogs as too many can also cause too much rescheduling. Like all ST connected devices, you need first to unselect/remove your ecobee device from all the smartapps as MyEcobeeInit will not uninstall w/o doing this step. MyEcobeeInit is the Service Manager for MyEcobee Device, so uninstalling the smartapp means that all your ecobee devices will be deleted. Do not forget to set the trace back to 'false' after your debugging session as this setting may impact performance. Most of the time (unless specified otherwise), you just need to copy and paste the My Ecobee Device's code from the text file from my email (I will send you emails with a zip file attached when required). Click on the device you want to update. Copy and paste the code, save & publish. N.B. Make sure to copy and paste ALL the code! All my smartapp are at the end of the "new (only at github)" window. There seems to be a generic issue with some custom DTHs and it doesn't affect the DTH normal behavior. a) Like any SmartThings device, first you'd need to unselect My Ecobee device(s) and its remote sensors (if any) from all smartapps and/or routines (ex Amazon Echo). If you have Amazon echo, you need to deactivate the automatic discovery of devices first (i.e., 'Allow access to all Devices, Scenes and Routines' in the Amazon smartapp under Automations/smartapps), before trying to remove any devices. or click on the smartapps tab on the device itself under the ST mobile app. b) Click on My Ecobee device(s) and any Remote Sensors devices. d) Finally, you can remove the ecobeeRemoteSensorInit (if you have any remote sensors) and, then MyEcobeeInit smartapps. These exceptions are thrown by the ST backend from time to time when using the Async Http requests. I've been told that ST is working on it. This is not a specific issue with my code. The temperature scale needs to be changed for your ST account under the ST classic Mobile app, so that all your ST devices will be in Celsius. At the next "refresh", My ecobee Device will display the values in the metric system. This page was last edited on 1 April 2019, at 14:22.